Here at Butlers Chauffeur Drive we know that to many of our customers the need to reduce their carbon footprint is just as important as being driven in a deluxe executive car. For this reason we provide the choice of an eco friendly model for your chauffeur driven requirements. 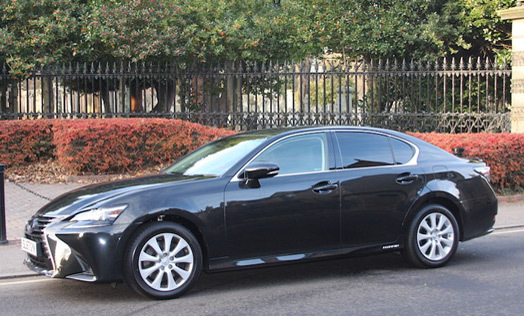 Lexus GS 300h executive hybrid has a reputation for outstanding quality and reliability. Its hybrid technology allows it to run in near silent, all-electric EV mode in slow moving traffic, reducing emissions and fuel consumption to zero. The chauffeur driven Lexus GS Executive hybrid with its black exterior is an ideal executive wedding car for the bride or groom.